You don’t need to go far to get your ski or snowboarding fix near Toronto. There are many great places to hit the slopes one to two hours (or less) from the city. If you want to take advantage of the snowy weather and get some fresh air, fun and exercise on skis or a snowboard, here are eight of the best places to ski near Toronto. 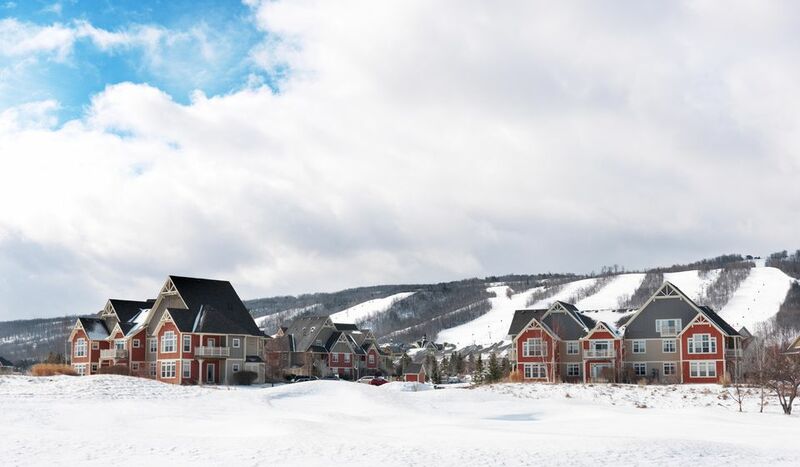 Blue Mountain is the largest mountain village resort in Ontario and it’s definitely a ski destination that offers something for everyone, including many winter activities beyond skiing and snowboarding. But since we’re here to talk skiing, Blue Mountain boasts 365 acres of skiable terrain and 43 named trails, including 30 that are lit for night skiing. The wide range of runs means there’s a difficulty level to suit everyone, from total beginners to advanced skiers. Freestylers can take advantage of two terrain parks, and anyone who needs a break from the slopes can do some snowshoeing, glide down some hills in a snow tube, or skate on the epic Woodview Mountaintop skating rink, a 1.1 kilometre skating loop with amazing views of the Niagara Escarpment. There’s a variety of on-site accommodations here, as well as spas, bars and restaurants. Don’t miss: Relaxing in the steamy outdoor Scandinavian baths of Scandinave Spa, where you can watch skiers swooshing down the slopes as you soak. Barrie is where you’ll find Horseshoe Valley, a ski resort offering 28 ski and snowboard runs as well as 32 kilometres of groomed trails for cross country skiing and snowshoeing. There’s also a terrain park here for freestylers. In addition to skiing and snowboarding, Horseshoe Valley offers a whole host of other wither activities, including snowshoeing, snow tubing, fat biking and skating. On-site accommodation is available and there’s also an indoor pool (day pass available if you’re only visiting for the day), a spa and several restaurants. Don’t miss: Tube & Dine Thursdays, wherein you get unlimited snow tubing and a $15 dining credit at the Crazy Horse Sports Bar & Grill for just $24.99. Another resort fairly close to Toronto is Snow Valley. It’s a smaller resort than some, but tends to be less crowded. They’ve got 19 runs in total for skiers and snowboarders, as well as a terrain park. There are also 14 kilometres of marked trails for snowshoeing and 14 snow tubing runs. There’s no on-site accommodation here, but Barrie is only five minutes away so if you want to stay, there are many hotel options nearby. Don’t miss: Racing down one of the 14 snow tubing runs for a fun winter rush that doesn’t involve strapping on a pair of skis. Mount St. Louis Moonstone is a large ski resort just north of Barrie and one of the largest family owned ski resorts in Ontario. Here you’ll find 36 runs over 170 skiable acres, with the longest run coming in at an impressive two kilometres. The focus here is strictly on skiing and snowboarding and you’ll find some of the best snow at Mount St. Louis. Freestylers can work on their skills in three terrain parks and snowboarders have two groomed half pipes to take advantage of. There are no on-site accommodations, but proximity to Barrie means you have nearby options if you want to stay. Don’t miss: Night skiing one of the mountain’s lit trails. Take a day trip to Hockley Valley for a skiing experience at a smaller resort. There are 14 runs here for skiing and snowboarding, with many being open for night skiing, and a well-equipped terrain park for freestylers. If you’re looking to spend the night, there are accommodations on-site and four restaurants to choose from. Don’t miss: Soothing your tired après-ski muscles with a relaxing massage at the resort’s spa. Uxbridge is where you’ll find Lakeridge Resort, which offers 23 runs spread over 70 acres. There are also mogul runs for advanced skiers and three terrain parks for anyone wanting to show off (or work on) their freestyling skills. Two cafeterias offer slope side views so you can watch other skiers as you enjoy an après-ski snack or drink. There are no accommodations on-site, but Uxbridge has several bed and breakfasts should you want to spend a night or two. Hidden Valley in Huntsville is a small ski resort with 13 runs on 35 skiable acres. They also offer night skiing and a terrain park. The small size makes this an ideal spot for beginners and families and if you want to stay, Hidden Valley Resort is located right next door, which has slope side accommodations, a restaurant, a pool and a sauna. Glen Eden is another smaller ski resort, but there are 12 runs here for skiers and snowboarders of all levels and it’s conveniently close to Toronto. Glen Eden also has a terrain park and a snow tubing area for anyone who doesn’t feel like skiing, or who wants a break for a bit.